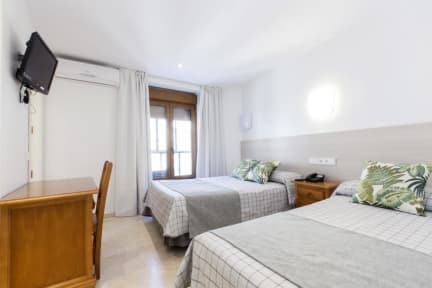 Hostal Castilla III Puerta del Sol, Madryt, Hiszpania : Rezerwuj teraz! Hostel 'Castilla III' Puerta del Sol is in next to Puerta del Sol; is a new hostel which opened in August 2005. 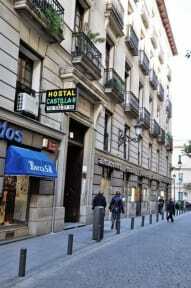 It is located in the city centre of Madrid, just 20 metres from Plaza Mayor and Puerta del Sol. All the rooms are carefully decorated with a special touch, and bathrooms are clean and spacious. If you are looking for entertainment, this is the place for you! We are just few minutes from nightclubs, restaurants and bars. We are also within walking distance from Palacio Real, Museo del Prado, Museo Reina Sofia and more. Come and visit our new place! Check-IN is from approximately 13:00 p.m. If your room is not yet available when you check-in, you may leave your luggage at the reception desk. Check-out is at 12:00 a.m. Triple room bed.....:3 separate beds. 1) We suggest that you print your booking confirmation. 2) Customer Register is in Hostel Castilla II (St Marques Viudo de Pontejos 2 1), opposite building across the street. If you inform us of the cancellation , total or partial, at least 3 days before your arrival date, no costs will be incurred.